Please send me more info and current offers for your Galaxy II Eco Catamaran Cruises In The Galapagos. 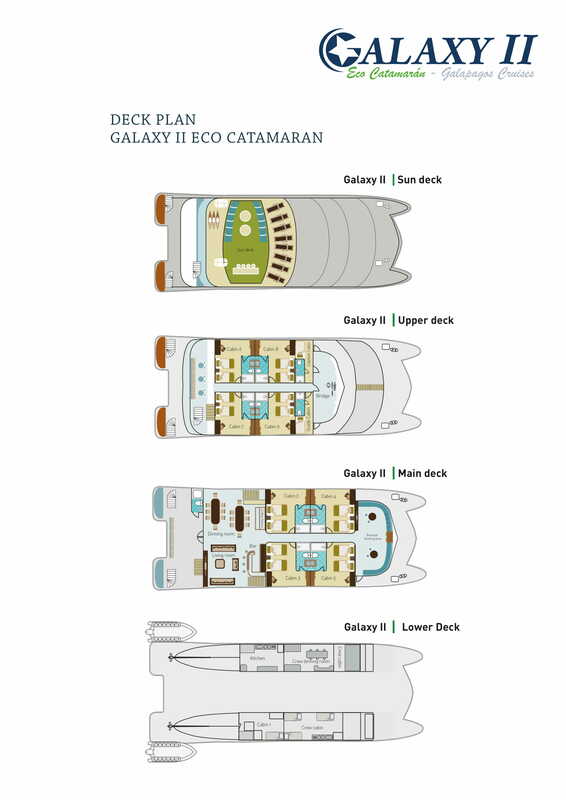 Experience the magic of the Enchanted Isles aboard the Galaxy II Eco Catamaran. The new luxury catamaran not only allows you to explore the wealth of the Galapagos Islands, a naturalist’s paradise, but the catamaran was built to reduce the environmental impacts of tourism so that the Galapagos can remain the paradise we found. Hike, snorkel, kayak and watch for wildlife throughout the islands know that you are traveling aboard a catamaran that practices responsible tourism from its construction to its fuel and water consumption. Each day, your Galapagos cruise tour takes you into the captivating heart of the archipelago. From the moment you wake up, you are surrounded by panoramic views of the sea and the chance to see a passing whale, dolphin or bird heading to its nest. Onshore, you actively experience the Galapagos Islands with naturalist-led hikes, snorkeling and swimming sessions and sea kayaking expeditions—not to mention the face-to-face time with some of the most amazing and friendly wildlife in the world. Whether you’re swimming with Galapagos penguins, sea lions and sea turtles or walking alongside giant Galapagos tortoises, hopping blue-footed boobies or sun-bathing marine iguanas, each day is a fascinating look into a unique wildlife haven. Experience the full wonders of the Galapagos onboard the Galaxy II Eco Catamaran, and do it in the comfort only a luxury cruise ship can bring you. Travel from Santa Cruz to San Cristobal Islands on this introductory 4-day expedition through the Galapagos Islands. Get up close to giant tortoises at the Charles Darwin Station, go snorkeling in the spectacular crater of Devil’s Crown and witness marine iguanas, finches and masked boobies while hiking on Española Island. Fly into Baltra Island airport where you will be welcomed by one of our representatives and transferred to the Galaxy II. Enjoy lunch on board, then make your first excursion to the Charles Darwin Research Station in the main port of Santa Cruz. Witness giant Galapagos tortoises and land iguanas up close and learn about the conservation work being done to ensure their survival. We’ll begin the day with a wet landing at Punta Cormorant on the west coast of Floreana Island, which is famed for its dark green beach composed of olivine crystals. Go fossicking for a range of marine invertebrates and photograph the sea lions, marine iguanas and pelicans often found here. Our second stop for the day is at the submerged crater of Devil’s Crown, one of the best snorkeling locations in the Galapagos Islands. Take advantage of the excellent visibility to spot tropical fish, purple sea stars and spiky sea urchins, as well as harmless white-tipped sharks. In the afternoon we’ll continue to Post Office Bay on the northern shores of Floreana Island where a wooden barrel was established as the island’s original post office in 1793. You can still drop your postcards in the barrel today to send to family and friends back home! After breakfast on board, we’ll make a dry landing at Punta Suarez, which boasts a high percentage of endemism due to its isolated location. Keep an eye out for blue-footed boobies and waved albatross as we walk across Española Island, together with large colonies of marine iguanas, finches and masked boobies. After lunch on board, we’ll continue to Gardner Bay for a short walk along the beach to observe its boisterous colony of sea lions. You’ll have plenty of time to swim and snorkel in these marine species-rich waters to spot sea turtles, marine iguanas and a staggering diversity of tropical fish. We’ll arrive early in the capital of the Galapagos at San Cristobal to visit the impressive Puerto Baquerizo Interpretation Center. Learn about the formation of the archipelago, the evolution of its species and the human settlements that have left their market on the Galapagos Islands. Experience the wildlife diversity and volcanic landscapes of Santa Fe, the South Plazas and North Seymour Island on this 5-day itinerary from San Cristobal. Navigate around the iconic Kicker Rock while spotting sea birds, witness the unique land iguanas of Santa Fe and go snorkeling in the marine-rich waters of Darwin Bay. Fly into San Cristobal Island where you will be met by one of our representatives and transferred to the Galaxy II. Settle into your cabin and enjoy lunch on board as you are given your first orientation while the crew weighs anchor. In the afternoon we will navigate Kicker Rock (or Leon Dormido), which features two rocks resembling a lion and serves as a nesting site for numerous seabirds. After breakfast on board, we will make a wet landing on Santa Fe Island to go hiking, swimming and snorkeling. It’s beautiful bay is protected by a natural barrier of rocks where a colony of sea lions resides. Santa Fe is home to one of two species of land iguanas found in the Galapagos Islands that feed on the fruits of cactus. Marine iguanas and land doves can also be spotted, together with sea tortoises, rays and a variety of tropical fishes while snorkeling. In the afternoon we will sail to the South Plazas, two small islands created by land uplift that are home to a unique (and slightly smaller) species of land iguana. We’ll hike along a spectacular cliff where sea birds nest and witness the colony of around 1,000 sea lions that play boisterously along the shores. We’ll begin the day with an excursion to North Seymour Island, which was formed by the uplift of volcanic marine lava and is home to marine fossils dating to the Pleistocene era. A healthy population of land iguanas brought from Baltra Island can be seen here, together with bushy vegetation favored by frigatebirds. After lunch on board, we’ll continue to Mosquera Islet that nestles between Baltra and North Seymour Islands. It’s home to a large colony of sea lions that reside alongside several species of birds. This morning we'll make a wet landing at Darwin Bay on Genovesa, a small island in the northeast of the archipelago. Follow the walking trail that leads through its mangrove swamp to spot frigatebirds, marine iguanas, red-footed and masked boobies, then dive into the waters to cool off while snorkeling. In the afternoon we’ll visit El Barranco, or Prince Phillip’s Steps, and follow the trail to spot tropic birds, red-footed boobies, Nazca boobies, doves, finches and frigatebirds. Your final day begins with a navigation of Punta Carrion in the northeast of Santa Cruz where you can spot a variety of sea birds nesting in the rocky cliffs. It’s then time to transfer to the airport for your return flight to mainland Ecuador. Discover the natural wonders of Santa Cruz, Isabela and Fernandina Islands on this 6-day itinerary from Baltra. Witness white-tipped reef sharks at Tintoreras in the bay of Puerto Villamil, spot giant tortoises and land iguanas while hiking at Urbina Bay, then go snorkeling amidst a myriad of marine life at Punta Vicente Roca. Fly into Baltra Island airport where you will be welcomed by one of our representatives and transferred to the Galaxy II. Enjoy lunch on board, then make your first excursion to the Charles Darwin Research Station in the main port of Santa Cruz. Witness giant Galapagos tortoises and land iguanas up close, with the center serving as the main breeding site in the archipelago, and learn about the conservation work being done to ensure their survival. After breakfast on board, begin the day with an excursion to Tintoreras in the bay of Puerto Villamil and enjoy a short walk to see the large numbers of marine iguanas basking in the sun, together with lava lizards, herons and sea lions. The island is named after the white-tipped reef sharks (“tintoreras”) that can often be seen swimming in the channels, together with sea turtles, rays and a vast array of tropical fish. In the afternoon we will travel to the breeding center that’s located just outside of Puerto Villamil and is dedicated to the reproduction of various species of tortoises. Wander its beautiful gardens that are home to a range of native plant species, then visit the Humedales and Orchilla Hill to soak up the views of Puerto Villamil, the Sierra Negra Volcano and the surrounding islets. We’ll also visit the historic “Wall of Tears”, which was built by prisoners and stands as a lasting legacy of the Galapagos Islands’ human history. This morning we will anchor in Elizabeth Bay on the west coast of Isabela Island, which is one of the archipelago’s most important penguin breeding sites. Wander through the red mangrove cove that is home to brown pelicans and flightless cormorants, as well as spotted eagle rays, golden rays and sea lions. After lunch on board, we'll make an excursion to Urbina Bay, which nestles at the base of Alcedo Volcano. Follow the short trail to spot land iguanas, giant tortoises and Galapagos hawks, while also keeping an eye out for red and blue lobsters. This morning we’ll travel to Espinoza Point on Fernandina Island that is renowned for its large colony of marine iguanas. It’s also home to healthy populations of flightless cormorants, Galapagos penguins and hawks, while boasting magnificent views across Fernandina and its towering volcano. After lunch on board, we’ll continue to Punta Vicente Roca on Isabela Island, which is comprised of two separate coves. Photograph the sea lions and marine iguanas, together with flightless cormorants, blue-footed and masked boobies, then enjoy a snorkeling excursion to spot seahorses and the unique mola mola sunfish. After breakfast on board, we’ll make an excursion to the black sand beach of Egas Point that is colored due to volcanic deposits from the Pan de Azucar volcano. Its crater lake transforms to a salt mine during the dry months, which functioned unsuccessfully in the early 20th century. In the afternoon we’ll stop at Rabida Island to explore its red sand beach, coastal lagoon and arid vegetation. Witness its colony of sea lions basking on the red-tinged rocks, together with brown pelicans, blue-footed and masked boobies. Your final day begins with an excursion to Black Turtle Cove in the north of Santa Cruz Island, which is surrounded by mangroves and accessible only by dinghy. It provides a safe refuge for an abundance of marine life, including sea turtles, rays and black-tip reef sharks. Experience the volcanic landscapes of Bartolome Island and wildlife endemism of Española Island on this 6-day itinerary from Baltra. Go swimming and snorkeling off the white sands of Las Bachas Beach, witness the pahoehoe flows of Santiago Island and get up close to giant tortoises at the Charles Darwin Station. Fly into Baltra Island airport where you will be welcomed by one of our representatives and transferred to the Galaxy II. Enjoy a welcome drink on board and lunch before embarking on your first excursion to the beautiful beach of Las Bachas. It is named after the barges that were abandoned here by the US Navy during World War II, with a flamingo-filled lagoon and idyllic waters for snorkeling and swimming. Begin the day with a wet landing at Sullivan Bay, which is renowned for its pristine lava landscapes, including impressive pahoehoe flows and lava colonizing plants. As you enjoy lunch on board, we will sail towards Bartolome Island to witness its incredible lava cones and pipes on a hike to the summit, from where there are magnificent views across the archipelago. There will also be plenty of time for swimming and snorkeling in the afternoon before searching for penguins at Pinnacle Rock. Day 3 - Santa Cruz Island - Highlands & Charles Darwin Station. After breakfast on board, we’ll embark on an excursion into the highlands of Santa Cruz for a short trek to find giant tortoises in their natural habitat. Then return to the main port of Santa Cruz Island to visit the Charles Darwin Station and learn about the vital conservation work being conducted and breeding of giant Galapagos tortoises and land iguanas. Our second stop for the day is at the submerged crater of Devil’s Crown, one of the best snorkeling locations in the Galapagos Islands. Take advantage of the excellent visibility to spot tropical fish, purple sea stars and spiky sea urchins, as well as white-tipped sharks. We’ll arrive early in the capital of the Galapagos Islands at San Cristobal to visit the modern architectural space of the Puerto Baquerizo Interpretation Center. Learn about the formation of the archipelago, the evolution of its species and the human settlements that have left their mark on the Galapagos Islands. Encounter incredible wildlife and unique volcanic landscapes on the islands of Isabela, Bartolome, Fernandina and Santa Cruz during this 8-day itinerary from Baltra. Witness white-tipped reef sharks at Tintoreras, go snorkeling in the marine-rich waters of Punta Vicente Roca and photograph the impressive pahoehoe lava flows of Sullivan Bay. Fly into Baltra Island airport where you will be welcomed by one of our representatives and transferred to the Galaxy II. Enjoy lunch on board, then make your first excursion to the Charles Darwin Station in the main port of Santa Cruz. Witness giant Galapagos tortoises and land iguanas up close, with the center serving as the main breeding site in the archipelago, and learn about the conservation work being done to ensure their survival. After lunch on board, we’ll continue to Punta Vicente Roca on Isabela Island, which is comprised of two separate coves. Photograph the sea lions and marine iguanas, together with blue-footed and masked boobies and flightless cormorants, then enjoy a snorkeling excursion to spot seahorses and the unique mola mola sunfish. After breakfast, we’ll embark on an excursion to Black Turtle Cove in the north of Santa Cruz Island, which is surrounded by mangroves and accessible only by dinghy. It provides a safe refuge for an abundance of marine life, including sea turtles, rays and black-tip reef sharks. We will also stop at the beautiful beach of Las Bachas, named after the barges that were abandoned here by the US Navy during World War II, which features a flamingo-filled lagoon and idyllic waters for snorkeling and swimming. After breakfast on board, we’ll embark on an excursion into the highlands of Santa Cruz for a short trek to find giant tortoises in their natural habitat. Then it’s time to transfer to the airport for your return flight to mainland Ecuador. All cabins have private facilities such as: private bathrooms, cold/hot water, air conditioned, hair dryer, telephone for internal communication on board, safe box and high speaker. All the cabins have private facilities such as: private bathrooms, cold/hot water, air conditioned, hair dryer, telephone for internal communication on board, safe box and high speaker. Yes. On this trip, all of the equipment is on board. If you get cold easily you may want to bring or rent a wetsuit.